DescriptionA very rare and good example of an early George III, Scottish Sterling Silver Teapot made by Lothian & Robertson in Edinburgh and dating from c1765. 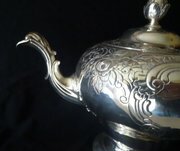 The underside of the teapot is hallmarked with the maker's mark "L&R" for Lothian & Robertson, the Scottish thistle sterling silver mark, the Edinburgh castle town mark and date letter "L" for 1765/66. 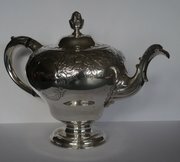 The teapot is of inverted pear shape and has a chased decorative border - see photos. The teapot measures 6 1/2" inches (160mm) in height. The weight is 642g/22.7oz.